Updated with Kaby Lake processors and faster SSDs in June of 2017. Subscribe for regular MacRumors news and future MacBook info. Apple introduced the second update to its ultra-thin 12-inch MacBook on June 5, 2017, debuting new machines with faster processors, better graphics, faster SSDs, and support for up to 16GB RAM. Aside from these internal changes and the addition of a revamped keyboard, the MacBooks are identical to previous-generation 2016 models. First introduced in March of 2015, the MacBook is Apple's newest Mac product line, distinct from the existing MacBook Air and MacBook Pro lineups. The MacBook is Apple's thinnest, lightest Mac to date with terraced battery technology and a fanless design enabled by a low-power Core M processor. Measuring in at 13.1mm thick, the MacBook is 24 percent thinner than the MacBook Air, and it weighs just two pounds, lighter than both the 2.38 pound 11-inch MacBook Air and the 2.96 pound 13-inch MacBook Air. It has a 12-inch Retina display with a resolution of 2304 x 1440. The third-generation MacBook continues to use the same design as the original version, featuring a full-size edge-to-edge keyboard with a speaker grille located above to save space, MacBook Pro-style black display bezels, and a Force Touch trackpad that enables Force Click, allowing users to use pressure-based click gestures. The trackpad also incorporates haptic feedback for a tactile response when it's used. Due to its thinness, the MacBook uses a second-generation "butterfly mechanism" for the keyboard keys to make them 40 percent thinner than traditional keyboard keys and significantly changing the feel. The keys are also more stable for better precision when typing and each key is backlit with a single LED for uniform brightness. Apple's MacBook initially came in four colors -- Silver, Space Gray, Gold, and Rose Gold -- but Apple eliminated the Rose Gold option in October 2018 when it introduced new Mac mini and MacBook Pro machines. The 2017 MacBook uses Intel's Kaby Lake chips with integrated Intel Intel HD Graphics 615 for 20 percent improved processor speeds and faster graphics performance. Also included is 50 percent faster PCIe-based flash storage and up to 16GB of 1866 MHz memory. A single USB-C port continues to supply power, USB 3.1 connectivity, and DisplayPort 1.2, HDMI, and VGA capabilities. The MacBook continues to feature 802.11ac Wi-Fi, Bluetooth 4.0, stereo speakers, dual microphones, a 3.5mm headphone jack, and a 480p FaceTime camera. The 2017 MacBook features up to 10 hours of battery life when browsing the web and up to 12 hours of iTunes movie playback thanks to the new, more efficient Kaby Lake chips. Apple in June 2018 launched a keyboard repair program for MacBook and MacBook Pro models equipped with butterfly keys to address complaints over letters or characters that repeat unexpectedly, letters or characters that do not repair, and keys that feel "sticky" or do not respond in a consistent manner. 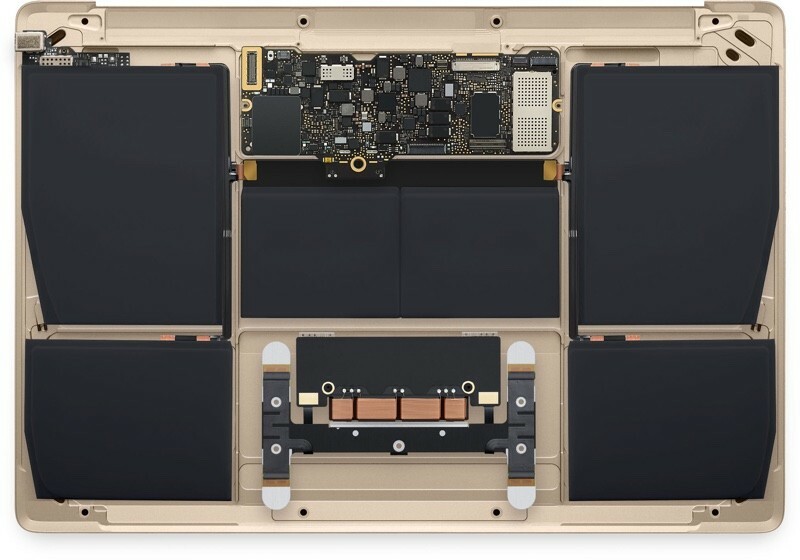 MacBook and MacBook Pro models from 2015 to 2017 that are manufactured with first or second-generation butterfly keyboards can experience these problems, which Apple will fix for free under the new repair program. A specific list of eligible models is below, and if you don't know your MacBook or MacBook Pro model, you can find out by clicking on the Apple logo in the menu bar and selecting "About This Mac." For keys that are sticky, Apple may do a keycap repair, but for repeating keys and issues with persistent stickiness, Apple will do a full keyboard replacement. Repairs will take between 5 to 7 days in most cases. To initiate the repair process, customers should find an Apple Authorized Service Provider, make an appointment at an Apple retail store, or mail the device into an Apple Repair Center after contacting Apple support. MacBook and MacBook Pro models believed to have problems will need to be assessed by Apple, and free from other damage (such as water damage) to be eligible for a free keyboard repair. Customers who experienced keyboard issues but have already paid for out-of-warranty repair fees can contact Apple's online or phone support team to inquire about a refund. Apple's repair program will cover MacBook and MacBook Pro models for four years following the date of purchase, so machines purchased in 2016, for example, will be covered until 2020. Apple is prioritizing MacBook and MacBook Pro keyboard repairs and requiring Apple retail staff to perform the repairs in store rather than sending machines off to a repair facility, which takes days. Apple is aiming to offer next-day turnaround time MacBook and MacBook Pro keyboard replacements. Apple designed the MacBook to be thinner and lighter, but also more functional and intuitive. When it comes to appearance, the MacBook looks like a marriage between the MacBook Air and the MacBook Pro, featuring a super thin clamshell design and a black bezeled display. The MacBook design was introduced in 2015 and remains unchanged in 2017. At 13.1mm thick when closed, the MacBook is Apple's thinnest notebook to date, and it weighs just two pounds. The display portion of the notebook is only 0.88mm thick, which means it does not have room for the same light-up rear Apple logo that's found in Apple's existing MacBook Pro and Air lines. Instead, it has a polished, embedded Apple logo that more closely resembles the logos found on the iPhone and the iPad. The MacBook has an edge-to-edge keyboard with a speaker grille above the keyboard, and a single USB Type-C port on the left. On the right, there's a 3.5mm headphone jack. Aside from the USB-C port and the headphone jack, there are no other ports on the MacBook. 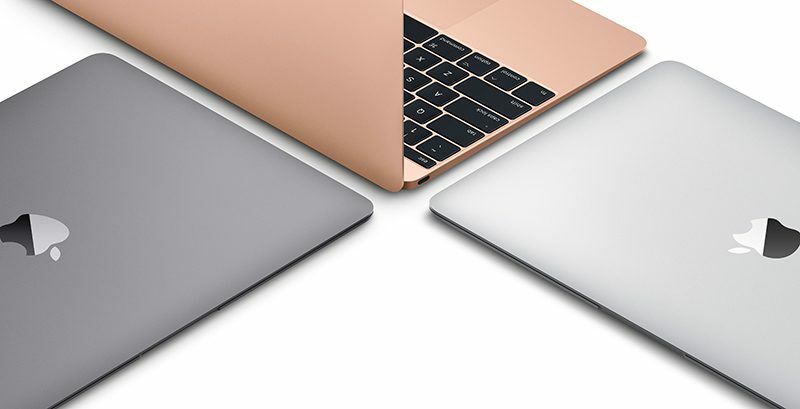 The MacBook is available in Gold, Silver, and Space Gray. 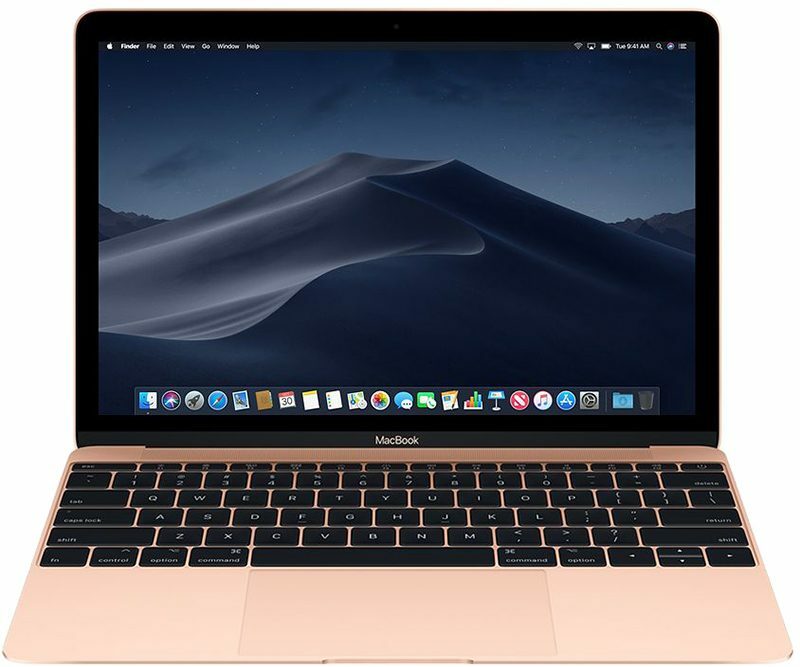 There was previously a Rose Gold model, but Apple eliminated the option in October 2018 when new MacBook Air and Mac mini models were released. The MacBook features a 12-inch Retina display that Apple calls "paper thin" at 0.88 millimeters. It's the thinnest Retina display ever on a Mac, which Apple says was created using a manufacturing process that creates edge-to-edge glass that's just 0.5 millimeters thick. It has a resolution of 2304 x 1440 with 226 pixels-per-inch, a 16:10 aspect ratio, and a 178 degree viewing angle. According to Apple, the MacBook includes redesigned pixels with a larger aperture, which allows more light to pass through. That let the company use LED backlighting that's 30 percent more power efficient but still offers the same level of brightness. Because the MacBook is so thin, Apple had to entirely redesign the keyboard, leading to a new key feel that's seen some criticism. According to Apple, the keyboard is "dramatically thinner" than the keyboard in the MacBook Air. It includes a butterfly mechanism underneath the keys that's 40 percent thinner than a traditional keyboard scissor mechanism, but also "four times more stable." Apple says that the butterfly design offers better precision regardless of where a finger strikes the key. A traditional scissor mechanism is focused on the center of the key, causing wobble around the edges. The MacBook required a more precise key because hitting a key off-center on such a thin keyboard could cause keystrokes not to register, leading to the more precise butterfly mechanism that ultimately takes up less vertical space. To keep the keyboard thin, Apple opted to remove the LEDs and light guide panel that traditionally light up its keyboards, opting instead for a single LED built into each key. This has the benefit of no light leak around each key cap for a much cleaner look. 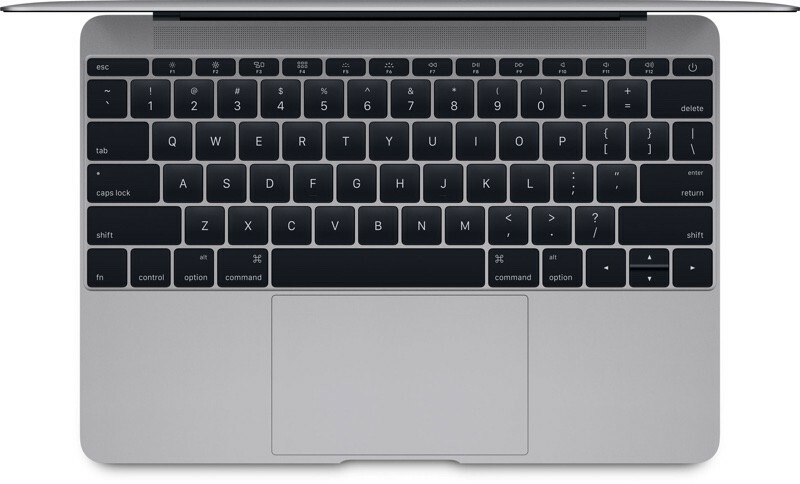 In the 2017 MacBook models, Apple has introduced a second-generation butterfly keyboard mechanism with dome switches beneath each key on the keyboard that have been optimized for a more responsive feel, delivering a greater sense of keyboard travel for a more satisfying press under the fingers. 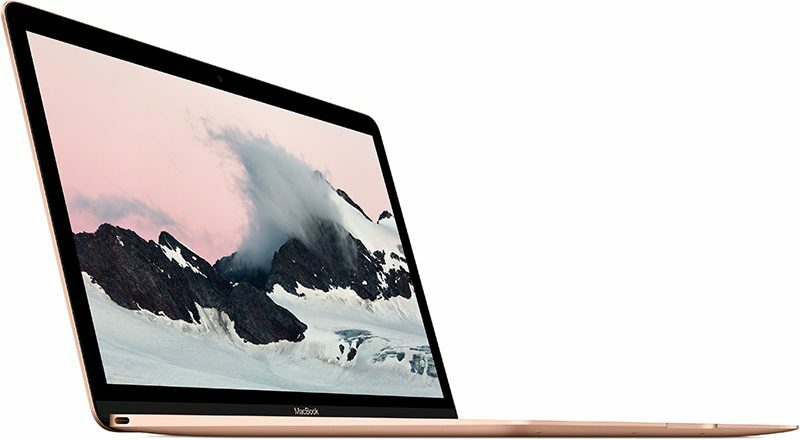 The third-generation MacBook uses Intel's Kaby Lake processors, enabling fanless operation. At the low end, the MacBook includes a 1.2GHz dual-core Intel Core m3 processor, while the higher-end machine uses a 1.3Hz dual-core Intel Core i5 processor. A 1.4GHz dual-core Intel Core i7 processor is available through Apple's custom configuration options. Kaby Lake processors are faster and more efficient than the previous-generation Skylake processors used in the second-generation MacBook, and thus the new MacBooks see speed improvements of up to 20 percent. All new MacBook models use integrated Intel HD Graphics 615, which are faster and more efficient than the Intel HD Graphics 515 used in the previous-generation MacBook. The MacBook supports full native resolution on the built-in display while also powering an external display of up to 3840 x 2160 pixels at 30Hz. Along with Kaby Lake processors and faster graphics, the 2017 MacBook's performance is also bolstered by much faster PCIe-based flash storage, which Apple says is 50 percent faster than the storage used in the previous-generation 2016 MacBook. As for RAM, the 2017 MacBook includes 8GB of 1866MHz LPDDR3 memory as a default option, which can be upgraded to 16GB of 1866MHz LPDDR3 memory. The MacBook includes a Force Touch trackpad, which has been standard on all of Apple's Mac refreshes since the feature was introduced last year. 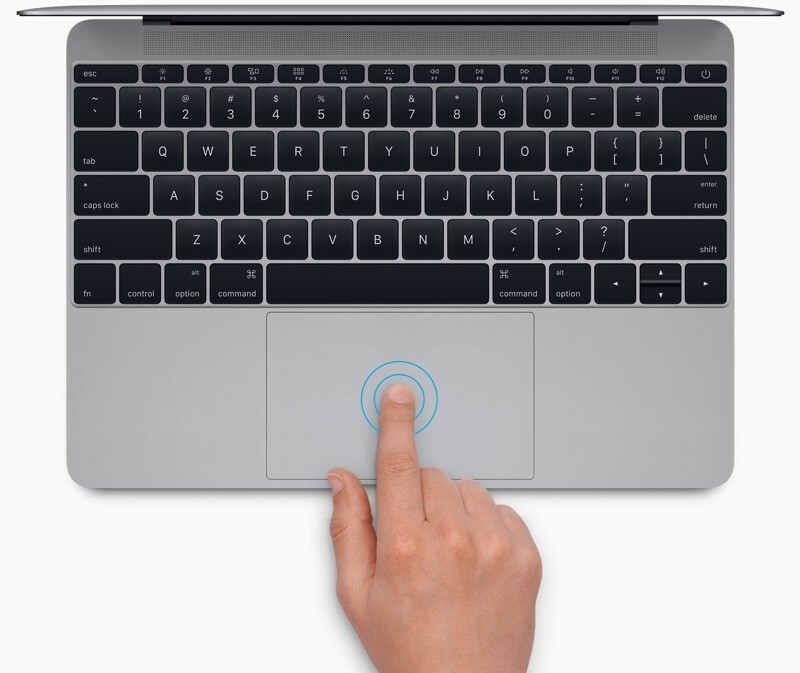 The Force Touch trackpad includes built-in force sensors to detect how much pressure is being applied to the surface of the trackpad, enabling pressure-based gestures. A "Force Click" gesture, for example, is enabled by a click and a long press. This brings up features like file previews on the desktop, maps in the Mail app and Wikipedia entries in Safari. Adding pressure to the trackpad when scrolling through the maps app or fast forwarding through a movie will gradually speed up movement, and when using features like Mark Up in the Mail app, Force Touch will be able to distinguish between thin strokes and harder presses. The Force Touch trackpad also has the benefit of being able to register a click on any part of the trackpad, an improvement over the trackpads of the MacBook Air and MacBook Pro. Existing trackpads can be difficult to click near the top part of the trackpad adjacent to the keyboard, a problem solved by the Force Touch trackpad. The trackpad includes a Taptic Engine that provides tactile feedback whenever it's pressed, letting the users feel what's happening on the screen in addition to seeing it. Apple says it delivers tangible responses to certain tasks, such as aligning annotations on a PDF. The MacBook's thin design prevents Apple from including standard USB and MagSafe ports for charging and as a result, it has just one USB-C port. There was some hope a third-generation machine would add an additional USB-C port, but the 2017 MacBook models continue to feature a single port. The port offers quick charging, USB 3.1 data transfer at speeds up to 5Gbps (Gen 1), and video output that supports HDMI, VGA, and DisplayPort 1.2 connections. Apple is selling a USB-C Digital AV Multiport Adapter for $79, allowing users to connect their MacBooks to an HDMI display while also connecting to a standard USB device and a USB-C charging cable. There's also a USB-C VGA Multiport Adapter that's priced at $79, which allows users to connect their MacBooks to a VGA display while also connecting to a standard USB device and a USB-C charging cable. A USB-C to USB adapter is available for $19. The third-generation MacBook features a 41.4-watt-hour battery, identical to the battery in previous generations. The MacBook's "all-day" battery lasts for up to 10 hours of wireless web browsing and up to 12 hours of iTunes movie playback, with up to 30 days of standby time. The MacBook charges through the included USB-C cable and power adapter. Apple downgraded the FaceTime camera in the MacBook when compared to the MacBook Air and the MacBook Pro, likely due to size constraints. The MacBook has a 480p FaceTime Camera, which was not improved in the third-generation machine. Above the keyboard, the MacBook has stereo speakers. It also includes dual microphones for clear audio when placing phone calls and conducting FaceTime video chats. Like the MacBook Air and the MacBook Pro, the MacBook includes 802.11ac Wi-Fi and Bluetooth 4.0. Apple's MacBook is available in two stock configurations, with an additional 1.4GHz Core i7 build-to-order customization option available for the processor. All models can be upgraded to 16GB RAM for an additional $200. - 1.2GHz dual-core Intel Core m3 Processor plus Intel HD Graphics 615 with 8GB of RAM and 256GB of flash storage. $1,299. - 1.3GHz dual-core Intel Core i5 processor plus Intel HD Graphics 615 with 8GB of RAM and 512GB of flash storage. $1,599. With the 1.4GHz upgrade, the entry-level MacBook price is $1,549. For the higher-end model, the 1.3GHz processor upgrade raises the price to $1,749. When adding in RAM upgrades, the cost of the MacBook tops out at $1,949. The new 2017 MacBook can be purchased from Apple.com or within retail Apple Stores. Prices start at $1,299 for the entry-level MacBook and go up to $1,949 for the top-of-the-line machine. For Macs made in 2009 and later, Apple offers a trade-in program in partnership with buyback company Phobio, allowing you to get up to $2,500 when trading in an eligible Mac. Trade-in via Apple is convenient, but you can often get a better price selling a Mac yourself. Apple in October 2018 held a Mac-centric event that saw the launch of a new MacBook Air machine that's very like the 12-inch MacBook, but the MacBook was neither discontinued nor updated, leaving its future unclear. The new MacBook Air features a faster 7W Amber Lake processor, a slimmer body, a Retina display, a third-generation butterfly keyboard, a Force Touch trackpad, Touch ID, a T2 chip for security, and a $1,199 price tag, meaning it's faster than the 12-inch MacBook, more affordable, and has a more appealing feature set. There is no word on when Apple might refresh the MacBook or what's in store for the machine given its similarity to the MacBook Air. Intel has announced its 8th-Generation "Amber Lake" Y-series processors, which are suitable for use in upcoming 2018 MacBook models. Chips appropriate for the 12-inch MacBook include the 1.1GHz Core m3-8100Y, the 1.3GHz Core i5-8200Y, and the 1.5GHz Core i7-8500Y, which have much higher maximum clock speeds than previous-generation chips, suggesting some significant performance and battery improvements. Intel says its new chips can last up to 16 hours on a single charge, while also offering double-digit gains in performance compared to previous-generation chips.